EPA says water safe, but arsenic at levels "considered harmful to humans"
Mayor chugs cup of water, says, "I'm gonna be fine"
(CNN) -- The drinking water in the area of last month's coal-sludge spill in eastern Tennessee is safe, but elevated levels of arsenic have been found in the sludge, authorities said. Properties near ground zero of the December 22 Tennessee spill are covered in sludge. 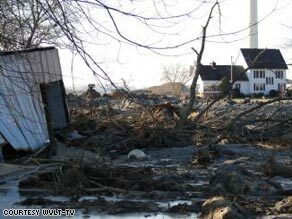 A billion gallons of the sludge, made up of water and fly ash from a coal-burning Tennessee Valley Authority steam plant in Kingston, Tennessee, swamped 300 acres of mostly private property when a dike on a retention pond collapsed December 22. All residents in the area were evacuated, and three homes were deemed uninhabitable, according to the TVA. About a dozen other homes were damaged. Preliminary results from water samples taken in the spill area show no unsafe levels of toxins, said Leslie Sims, on-scene coordinator for the Environmental Protection Agency. The testing includes municipal supplies and private wells, he said. "I'm gonna be fine," he quipped. However, samples of the fly ash scooped up along roadsides and river banks show elevated levels of arsenic that normally would trigger an EPA response, Sims said. "These are levels that we consider harmful to humans," he said. But the EPA is not responding because the TVA is taking action to fix the problem, he added. The arsenic is in the sludge but not in the air in significant amounts, said Alan Nye, a scientist with the Center for Toxicology and Environmental Health, a private scientific consulting company based in Arkansas. "The bottom line is that the air quality is very good and continues to be so," Nye said. That's not good enough for Suzanne Solomon, who rents a home about 2½ miles downwind from the spill zone. She and her family are moving somewhere they feel will be safe from fly ash that might blow around once it dries. "We have a 2-year-old daughter whose health is not worth the risk, even if it is a minuscule risk," she said. "I am an opera singer with mild asthma [and] I do not wish to expose [my lungs] to any dust which might become airborne. ... I do not see any way that they can keep all of this out of the air." Rather than try to gather up all the spilled ash, the TVA plans to lock it in place by planting seeds and covering it with mulch, said Bob Summers, the TVA's operations section chief. "We're hearing all kinds of stories," said Tom Vereb, whose formerly picturesque lakefront property is now caked in deep, swirling layers of gray muck and debris. "We're hearing everything from 'This is perfectly fine to be around,' to 'Get away, as far as you can, from it.' So we really don't know what the right answer is there. We're not going to get panicked about it." Howie Rose, director of the Roane County Emergency Management Agency, said the city of Kingston, about 40 miles west of Knoxville, has asked the EPA for long-term environmental monitoring, "and we've got a commitment for that." The TVA also is rebuilding the dike, as well as the roads and railroad tracks that were heavily damaged by the rushing sludge. "It's 40 feet deep of sludge in the middle of a channel, and they're talking about four to six weeks of cleanup," said Travis Cantrell, another local resident. "That'd be a stretch." Whether the plant will continue to store its fly ash -- a byproduct of coal-burning -- in ponds will have to be evaluated, said Tim Hope, the TVA's incident commander. "I would imagine that things would be done differently," Hope said. CNN's Brooke Baldwin, Taylor Gandossy and Mike Phelan contributed to this report.